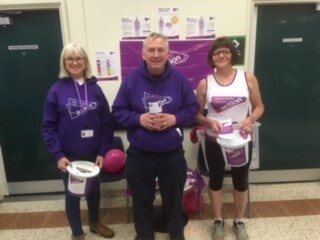 Brigg PCA charity fundraisers, Andrew Markham, Lesley Whitehand and Grazia Crosskill, have been busy holding a collection and awareness stand at Morrisons, in Scunthorpe. 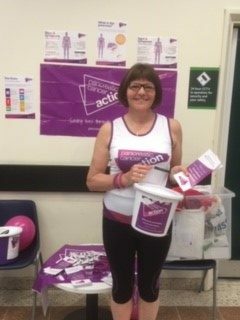 Andrew Markham and Lesley Whitehand are very active with raising awareness of pancreatic cancer within the Brigg local community, after having both lost friends and relatives to the disease. Grazia Crosskill is running the London Marathon in the hope of raising funds for PCA as her daughter recently lost her mother-in-law to the disease. The three of them raised a total of £400 all of which is going towards Grazia’s London Marathon fundraising target. As Grazia works for Morrisons, she is hoping to apply for match funding. All three are pictured, with Grazia proudly wearing her PCA running vest, ready for her big run. The group are planning to hold their next awareness event on 27th April. The day after Grazia will be taking part in the London Marathon. “Like most people I had hardly heard of Pancreatic Cancer. That was until a friend of mine, Howerd Stothard, a local postman, footballer, quiz organiser and all-round nice bloke was diagnosed in February 2012. He died in August that year. To see Howerd and his family go through the anguish of this horrendous disease was heart breaking. Not only for me but for his many friends in our small market town. There are lots of places that you can collect funds for us such as your local high street, a local sporting event, train station supermarket or shopping centre. Even just by placing one of our collection tins in a shop can collect over £30 within six weeks! Previous Article Helping A Loved One Through Cancer: What To Consider Next Article Thank you for taking part in Pyjamas for PanCan!